Notes: Sierran Guide Greg Vinci's X-Ray Caddis can be tied to two stages, a pupa form or a larvae form of a Rhyacophila Caddis or Green Sedge. 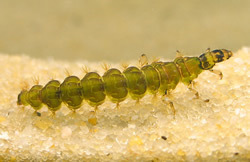 These are probably the most prolific caddis found within free-flowing Sierran streams. They are recognized by their deep segmentation with distinct body colorations of green to amber and a dark head. Greg will use a bead or use his "depth charge" beading arrangement with a larger black bead behind a smaller Copper or Gold bead on both of these stages to get these patterns down deeper into the water column. The Black Bead is flipped around so that the cavity will encapsulated part of the forward bead. 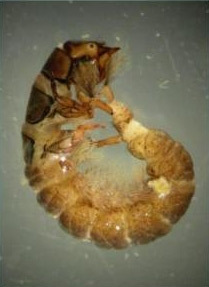 The body of an actual caddis larvae and pupa will show a bright glow from the gases it acumulates to rise. These patterns represent that glow significantly. 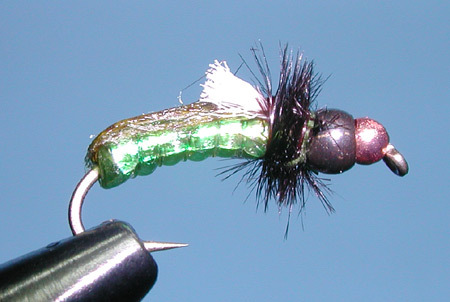 An underbody of Pearlescent Tinsel is wrapped beneath the overlay of a Scudback material with a Monofilament ribbing to provide a translucent body with subtle color changes. 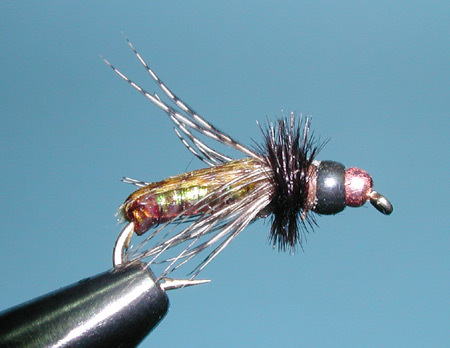 A partridge hackle is wrapped in front of the body of the Pupa form to represent emerging wings. On the larvae, a small tuft of White Polypro yarn will represent the gills. 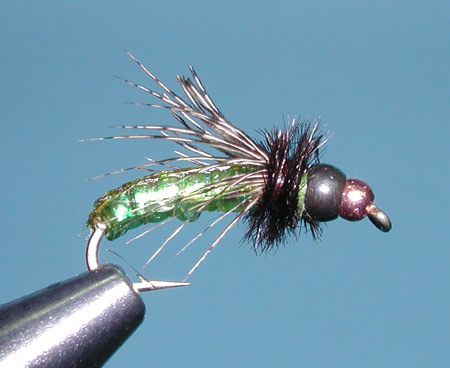 A collar of Ostrich completes both stages by representing the dark head of the caddis.